Hadoop is one of the most popular MapReduce solutions. Many organizations choose Hadoop as their big data store. syslog-ng Store Box allows seamless integration with Hadoop Distributed File System (HDFS), providing high performance log collection, distribution and pre processing. In our upcoming webinar, we will demonstrate how to directly stream any text-based log into HDFS while keeping a high performance rate using syslog-ng Store Box. István Molnár, Prooduct Marketing Manager and James Bonamico, presales- engineer. Please join us to explore the various ways syslog-ng can help bridge the gap between the cloud and on-premises resources with custom integrations built using syslog-ng’s Python API. •Fetching log messages from Azure Event Hub and feeding them to an on-premises log management/SIEM solution. •Forwarding on-premises log data to Google Pub/Sub for cloud-based processing. We can help eliminate your struggle to reliably collect and send your log data to Splunk. Register for our free webinar to learn how you can easily manage and scale log ingestion across your whole enterprise environment. syslog-ng can collect and centralize log data whether it's user activity, performance metrics, network traffic or any other log data. Remove data silos and gain full-stack visibility of your IT environment - one syslog-ng server can collect more than half a million log message per second from thousands of log sources. Attend this webinar to learn how your organization can reliably send and receive log messages via the TCP transport layer. Never lose log data by using the new Advanced Log Transfer Protocol (ALTP), which is a proprietary transport protocol that prevents message loss – even during connection breaks. See how syslog-ng Premium Edition leverages this new technology to communicate and manage log messages. Along with features such as flow-control and reliable disk-buffer, it is the best way to prevent log message loss. Dwelling deeper into reliable log ingestion to Splunk with syslog-ng by utilizing the HTTP event collector. Organizations heavily invest in log analytics and event management. That is why many of them consider SPLUNK as a viable solution. Yet that is only half of the solution as analytics are only as good as the data feed into it. Centralized log management technologies enable organizations to collect and distribute log reliability while guaranteeing optimal performance for SPLUNK. From this 60-minutes webinar session you will learn the benefits of front-ending Splunk with syslog-ng central log management solution. István Molnár, Product Marketing Manager and Craig Finnan, presales- engineer. Containerization, and Docker in particular, changed the way we distribute and run applications with conflicting dependencies. Thanks to syslog-ng, setting up a centralized log management infrastructure in Docker is as simple as issuing the “docker run” command. In our upcoming webinar, we will demonstrate how to set up and manage a syslog-ng Docker network. Parsing a specific log message for one specific use case is usually simple and the tools associated with it are widely understood. Parsing a broad set of messages for a broad set of use cases is much more complicated. Adding in performance requirements of tens or hundreds of thousands of messages per second only makes things even more difficult to accomplish. In our upcoming webinar the creator of syslog-ng, Balázs Scheidler, will showcase how to address these challenges with the latest syslog-ng Premium Edition 7.0.9. - Taking raw system logs and turning them into more useful and structured logs. - Retaining performance and turning the end result into dashboards for reliable log analysis and incident response. Our webinar focuses on how to fine tune syslog-ng for peak performance. Balabit, a One Identity business,will present some shocking research statistics and instructive breach stories involving the misuse of privileged credentials. Balabit’s recent global research showed that 4 in 5 companies were hit by a breach in 2017. In this kind of landscape, with both cyber-attacks and privileged users proliferating simultaneously – and with the GDPR re-framing our relationship with data security – now’s the time for IT teams to get better control of their networks. Security Evangelist and Program Director of Cybersecurity Academy at the National University of Public Service in Hungary. Watch this on-demand webinar to learn how syslog-ng can help your organization fine tune its log management infrastructure to get GDPR compliant. As GDPR is coming into force on the 25th of May, Balabit, a One Identity business, is launching a webinar session for both existing customers and to organizations facing difficulties in terms of managing privileged user access to personal data storages units. When it comes to managing privileged access and users there is more to it than preventing unauthorized access to Personal Data. Compliance to the GDPR is heavily dependent on monitoring workflows and ensuring that all processes align with the requirements. Join us on our 30 minute webinar session where you can find out how to manage privileged access and operations to ensure GDPR compliance with the help of Balabit's Privileged Session Management. With syslog-ng Premium Edition, you can collect Windows event logs without installing any third party application on your Windows-based computer. - You don’t need to install any additional application (reducing administrative overhead and possible security risk). You can manage the subscription from Windows Group Policy (permission, certificates, destination). - The Windows Event Collector (WEC) acts as a log collector and forwarder tool for the Microsoft Windows platform. Unlike the syslog-ng Agent for Windows, WEC is a standalone tool that does not require installing on the Windows-based host itself. This can be an advantage when your organization's policies restrict or do not allow the installation of third-party tools. Join our webinar to learn the benefits of using syslog-ng with Splunk. Many big data projects run into the 80/20 rule. 80% of resources is spent getting data into their analytic tools and only 20% on analyzing the data. 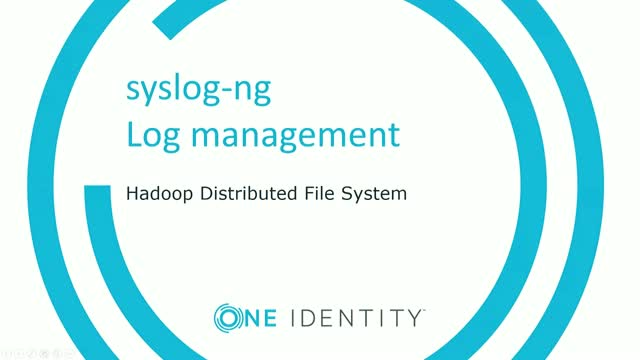 Syslog-ng functions as an universal log ingestion tool which can deliver data from a wide variety of sources to Hadoop, Elasticsearch, MongoDB, and Kafka as well as many others. Your log analytic tools depend on data collected by your logging infrastructure. Reducing the amount and complexity of data with advanced parsing and filtering can yield big results. In our webinar we provide a full overview and demonstration on how syslog-ng can filter, parse and rewrite collected log data as a pre-process mechanism before forwarding it to a SIEM system. Nonpublic Information represents all business critical information that contains Personal Identifiable Information and log messages are no exception. In our webinar session you can find out how syslog-ng can make your logging infrastructure 23 NYCRR 500 compliant. The General Data Protection Regulation mandates that Personal Data should be all time secured, stored in an encrypted format and only available to authorized personnel. The extended scope makes log messages also fall under the category of Personal Data and require the same level of attention. In our 45 minutes webinar session you can find out how to make your logging infrastructure GDPR compliant with the use of syslog-ng. SIEM solutions sit at the heart of Security Operations Centers (SOC) yet their effectiveness is only as good as the data feeding it. In order to maximize transfer reliability, data security and SIEM performance an optimized collection and distribution logging infrastructure is a must for all organizations. From this webinar session you can learn the benefits of front-ending your SIEM with syslog-ng. Benefits include: increased performance, higher quality data, and cost-effective scalability. syslog-ng delivers log data critical to understanding what is happening in your IT environment. Whether it's user activity, performance metrics, Windows Event logs, network traffic or any other type of log data, syslog-ng can collect, process and centralize it in real time, and forward it to your analytics tool. You can remove data silos and gain full-stack visibility of your IT environment. With syslog-ng, you can build a one-stop log data shop, find the logs you need in seconds and greatly enhance your SIEM efficiency. One Identity helps organizations optimize identity and access management. For more information, visit http://www.oneidentity.com. © 2018 One Identity LLC. ALL RIGHTS RESERVED. Presented by: István Molnár, Prooduct Marketing Manager and James Bonamico, presales- engineer.